Find CME meetings, live webinars, and self study courses from leading providers worldwide here at CME Sam. Follow us for the latest news in continuing medical education. 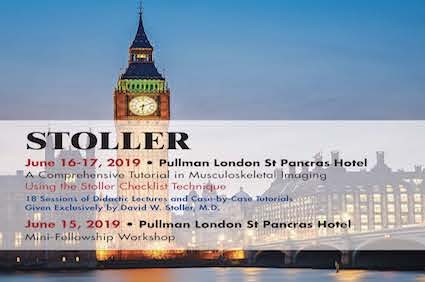 David Stoller MD and CME Science present Tutorial in Musculoskeletal Imaging and Mini-Fellowship Workshop including 18 didactic lectures of the entire field of orthopaedic MR imaging of the joints, as well as a Saturday workshop reviewing shoulder, knee, ankle, hip, wrist and elbow MR cases before the regular didactic checklist course, Saturday-Monday, June 15-17 at the Pullman London St Pancras Hotel. CRE Europe presents Essentials of Radiology in the Loire Valley including body MRI and breast imaging CME as well as biking and hiking through vinyards and villages at short distances so you can stop for a glass of wine or a tasty lunch along the way, Sunday-Saturday, May 12-18, at the Hotel Fontevraud in Fontevraud-l’Abbaye, France. Duke Radiology and Meetings By Mail release the latest Duke Radiology Review Course self study CME including multiple imaging modalities with special focus placed on the most timely topics, including MRI safety, radiation dose and incidental findings available both on DVD and Web Streaming. Thomas Jefferson University hosts its 5th Annual Current Issues in Coronary and Structural Heart Disease: A Multidisciplinary Approach focusing on the latest evidence-based guidelines designed to better equip participants with new diagnostic tools and therapies, Friday May 17, in Philadelphia. University of California San Francisco presents Imaging Update in Costa Rica including breast imaging, interventional, MSK, chest, body imaging and neuroradiology at the Los Suenos Marriott Ocean and Golf Resort, Sunday-Friday, December 8-13, with Wednesday off for rest and to enjoy the beautiful region. Hover over a CME provider and click a course type to view their course listings. Click a blue CME provider to visit their website.